Thank y'all for coming. 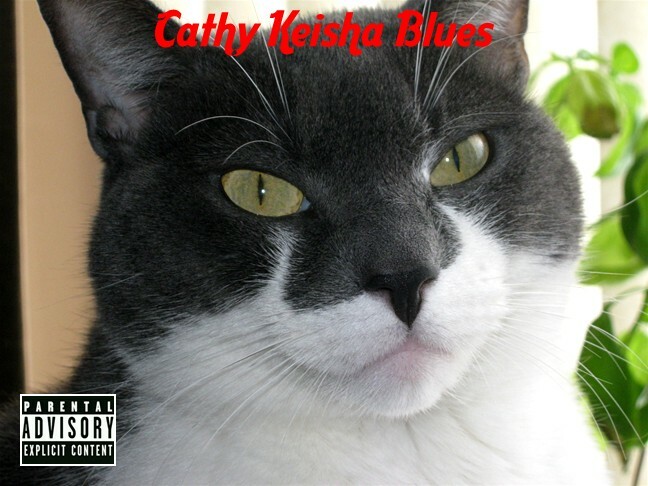 Tonight I'm gonna perform a tune off my brand new CD titled Cathy Keisha Blues. I hope y'all head over to iTunes to purchase it at the special price of $9.99 for a limited time only. You can also buy my Greatest Hits, including The Kitteh Poos Tonight, Biting Tree and Mean Mama Calico on iTunes. This little song is sung to the tune of Johnny Cash's Folsom Prison Blues. It's the first time I've done a duet with TW so I hope she doesn't entirely muck it up. She gonna warble the first part and then I take over for a rousing finale. CK is fast approaching and she means to do me harm. I better give up my chair cos that's where she wants to sit. If I don't get up fast, I'm gotten wind up bit. I hurried out of there. I like to hear The Woman squeal. When I bite The Woman well you know it makes my day. I'd like to thank Caren and Cody, Katie and Sparkle for letting me open the show for them. 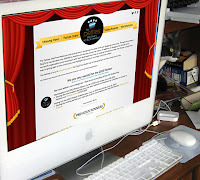 When I started this blog, my aim was to make my furrends and their peeps laugh. That's why I'm axing you to nominate me for a Petties Award in the Funniest Blog or Blogger category. I'm not trying to change the world or anything. I'd just like to make it a little lighter. Remember, you can nominate your fave shelter to win a $10,000 grant. Think of all the animals that would save. Now that would put a smile on everyone's face. Copy and paste http://www.stunningkeisha.com/ and add then your shelter's name. Pawsome text to the song ! Much much better than the original ! Just the tiny smartphone , so that's why I havent been commenting so much lately. Nice one Keisha. You have outdone yourself today. Have a super Saturday. You are one tough ghetto kitty, CK. I wouldn't like to get on the wrong side of you … or any side of you, come to that!! MOL, we're meowing along with you. Great song! Great song for sure. Our Mom says she would sure get out of your way! But seriously, we would love it if you could record it as an mp3 and post it here. MOL, the last line made my day. Reminds me of that Kilban cat song. Love to eat the mousies, mousies what I love to eat, bite theire little heads of nibble on their tiny feet. Happy Caturday! Great song and you sure do make our day a bit lighter and give us a smile or two - best of luck with the Petties! Purrs from the Zee and Zoey gang! You know, I think George is very brave to come visit you, now that I think about it. MOL, that was great! I wish it WAS available on iTunes. CK I need to know when your video is coming out...This song rocks! You're one tough kitty, CK, but if she shot you with a foam rocket she deserves what she gets! BEST. JOHNNY CASH. SONG. EVER!!! CK... you have truly outdone yourself. ...and yes, even TW has knocked our nip right off. Now Glogirly's got another earworm too! BRAVO! BRAVO! Now we've waiting for the music video CK! Great song again CK. We always enjoy your blog because you do make us laugh. CK, we had the mom sing that one to us! GREAT SONG!! Mom's singing...not so much. That sounds like good stuff!! Well, I shot a man in Reno just to watch him diiiiiiie... Oh wait--what? Oh right, well. I LOVED your song, CK. The Human actually laffed out loud as she sang your song! So, you wanna do a duet, eh?? We're very familiar with the old Folsom Prison Blues song, CK and I have to say, it never sounded better! Yeah! We love these lyrics. We do. You GO, CK! Cathy Keisha in DA HOUSE! Those tunes would be so pawsome to really listen. Through not on Itunes you and TK really make a real blueses rhyme. Hi Darling, Why don't you teleport up to Saskatchewan and join Me & Nerissa for our King-for-a-Day reign in Canada? We would pay $999.99 to see the live broadway show of this! Have a nice week friends! Oh theese one was a good one for sure!